Information on hiking trails around the Kansas City area. Updated 6-14-12. I don’t live there anymore so this probably won’t be updated. Park map. The South Shore Trail on the south side of the lake between shelters 8 & 10 runs through the off-leash area and is more straightforward there than the map suggests. The mountain bike trails are the main attraction. Park map. A combination of hiking, mountain bike, and equestrian trails. An old equestrian trail runs about 8 miles around the property and there are some newer hiking trails in at least 3 areas that connect to it, providing a hike of up to 10 miles. Many parts of this trail stay wet and muddy for a long time after a rain. Much of the trail is poorly routed (straight up and down hills for example) with subsequent massive erosion. An 1800 acre park near Lone Jack. Probably the closest to wilderness you’ll find in the metro area. Intriguing. Lots of equestrian trails going everywhere but none are publicly mapped. PTOC has an orienteering map showing trails and other features. Trail map. A network of mountain bike trails running parallel to the Blue River from about Minor Park south to almost 139th street. 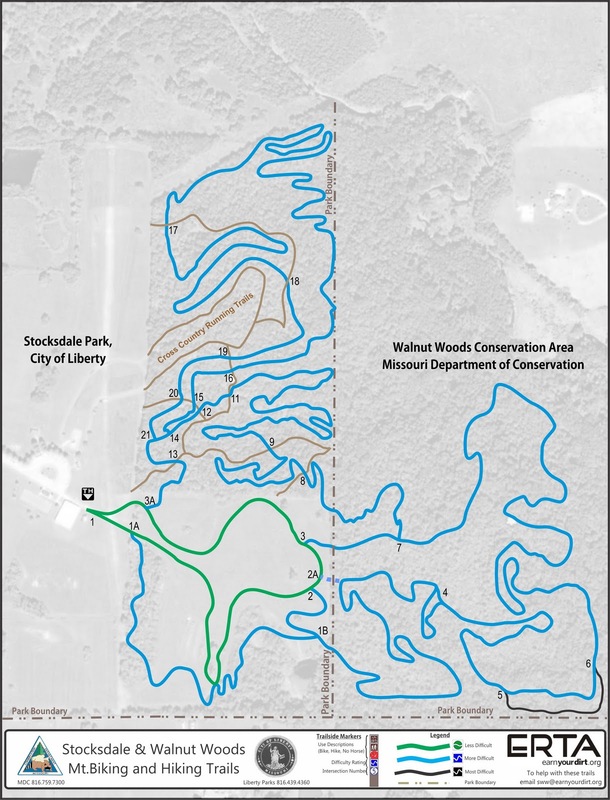 Will eventually connect to the Swope Park trails. Park map. Trails are short and covered with gravel but usable when many others are too wet. Park map. A nice little 3 mile hiking trail in SE corner of the area. Most of the other trails go through open fields or along their edge. Trail map. About 20 miles of trails. Something for everyone. One of my favorites. There are more trails south of Argo Road for hikers and horses but they’re unmapped and unmarked. Area map. A 3.5 mile equestrian trail. No decent publicly available trail maps. PTOC has an orienteering map showing trails and other features. Trail map. Mountain bike trails winding along the front and top of a rock ledge. Very cool. Old trail map. Some natural surface trails – rather short but kind of interesting. Spend some money in the visitor center/gift shop. Mountain bike trails. Not as interesting as Landahl. Equestrian trails. About 25 miles. There’s some good hiking here. The trails are well marked and in pretty good condition. The lettered reference points are places where the orange and white trails meet and there is often a marked post at those locations. The best areas are between C-H and Q-Y. Mountain bike trail map. Winds round and round through the woods without going very far. Trail map. Trails are short and very heavily used, lots of gravel. No mapped or marked trails. Most trails are old ATV ruts amidst scrub vegetation. Trail map. Some interesting but short and over-used trails. The extensive erosion of the scenic West Ridge trail makes me weep. Woodridge Primitive Area. 4.5 mile trail. Primitive camping permitted. North Shore Trails. About 21 miles of nice trails. The red “Land’s End” section is a favorite. Rockhaven Trails. Reportedly 30+ miles of equestrian trails along south shore. Adjacent to camping area. About 22 miles of equestrian trails. The northern part is the most interesting. Some parts are not very well blazed and the trail just seems to peter out. An outdated but lovingly-handdrawn map is available at the park office/marina. There’s also a small aerial photo with what looks like a GPS track. 28 mile loop for hikers only. Some parts very nice. Camping permitted in some areas. There’s a bike/hike trail on the west side of the lake but I think there’s been a lot of rerouting since this map was made. Equestrian trails on west side of the lake as well. Trail map. Interesting area. There are several old trails that aren’t on the current map. This isn’t a trail question, but have you ever attended the Walnut Valley Festival in Kansas? Never been there, but I’ve heard people talk about it. They made it sound like Woodstock with bluegrass. Ha! That is the perfect description….Woodstock for bluegrass! A great time. This a fantastic post, I have been doing research on local trails all day. Thank you for this page! I just hiked 4.5 miles in Stocksdale Park with a 2010 map (I couldn’t find anything more recent, until I stumbled upon your site). The 2012 map is going to come in handy next time, as I was quite confused today. Apparently significant changes were made in that time frame. Thank you for taking the time to share this information. Some places I had no idea about. I wish I could find places near the KC area where I can fish all night in relative peace and seclusion.